Rated by our users as rather untrustworthy with a tellows score of 7, our first number, 01143072406, has been a frequent guest on our top 5 list. Most of our users that reported the number have complained about unsolicited telemarketing calls by a well-known British energy and home services provider. As stated previously, calling on behalf of an insurance company to discuss an accident (very minor bump) had in 2012. Asked for personal details – including that of my family – before they’d continue with the call, which I refused until they confirmed some details to me. Of course, I was told that due to data protection, they wouldn’t divulge anything to me until I had to them!! […] Recommend ignoring unless you have five minutes to waste having a little fun with them…. I’m registered with TPS and ex-directory as well. however, i still recieve unsolicited calls. what use is TPS if it doesn’t work. I started answering, they still call every day and I swear at them. I have put in a report to TPS, I advise everyone else to as well. If you have received unsolicited or dubious calls or have any other information on a certain telephone number, do not hesitate to share it with our tellows community. Other than that, we hope you stay scam and nusicance call-free. This entry was posted in Weekly Top 3 Nuisance Callers and tagged annoying, nuisance calls, PPI, PPI claims, scam, scam numbers, spam, spam numbers, statistics, telephone, telephone numbers, tellows, tellows score, tellows.co.uk, top 5, weekly on Thursday September 26th, 2013 by Luise. This number has rung my mother several times over the past few days,no ideas who its from because theres no message and you cant ring it back. The number called me.. No message left for me. Previous calls from same number that I won’t answer. Calls day and night. Good number search shows me where the call is made from, the location to the nearest 25 metres. Guess what, I am in Sheffield next week on business. Will be nice to meet the person won’t it. I said i didn’t know whether he was really from Talk Talk and asked his name. He asked for my name,address and birth-date. I said I would check with Talk Talk and ring him back.He rang off. got call from this number it was from spectrum housing group telling me when my job would be done,nothing horrible no sales talk just spectrum. Finally, number 01625538490 from Macclesfield ranks as yet another newcomer on our fifth place this week. According to our users, the caller offers services to reclaim PPI for loans and credit cards. Most users have doubts regarding the legitimacy of the calls. 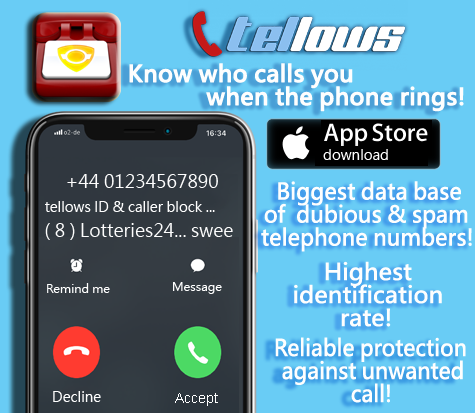 If you have recently received any calls from an unknown number that seem untrustworthy or dubious, do not hesitate to share your experiences on tellows.co.uk and help raise awareness about telephone spam and scam numbers. Have a nice weekend! This entry was posted in Weekly Top 3 Nuisance Callers and tagged annoying, nuisance calls, PPI, PPI claims, scam, scam numbers, spam, spam numbers, statistics, telephone, telephone numbers, tellows, tellows score, tellows.co.uk, top 5, weekly on Friday September 20th, 2013 by Luise. A woman asked about ‘Free Cavity wall insulation’, allegedly from British Gas. Just did not seem right. We’re with TPS, and now I’m annoyed. She was not aggressive, or pushy, but I do not want random people ringing me at home. Can’t see how 01782747000 can be a legitimate company selling bath lifts, because if you phone it they try and sell you legal representation services. I think the previous poster is confused between care-knight and bath-knight. I’m sure batch-knight are a very reliable company, but care-knight are definitely the company behind these cold calls on 01782747000. Our fourth number this week, 01133902114, is calling from Leeds and has been reported as a telemarketer. Even though some users question the legitimacy of the calls, others have allocated the number to a well-known UK internet service provider. If you have any further details on this or any other number, don’t hesistate to share them with the tellows community and help others to avoid telephone scams and spams. – It will be very much appreciated. Other than that, have a nice weekend free of telephone scams and spam! This entry was posted in Weekly Top 3 Nuisance Callers and tagged annoying, cold calls, nuisance calls, spam, spam numbers, statistics, telemarketer, telephone, telephone numbers, tellows, tellows score, tellows.co.uk, top 5, weekly on Friday September 13th, 2013 by Luise. As most of our tellows users know all too well, incessant calls from telemarketers or call centres have become a genuine nuisance. Thus, services to put a stop to these type of unsolicited calls enjoy increasing popularity. Aside from apps such as the tellows app to detect spam and scam calls, there is the option to register with the Telephone Preference Service (TPS) to prevent unwanted and cold calls. However, not all service provider are trustworthy: some fraudsters try to take advantage of the fact that many consumers are plagued by unsolicited calls. The police advise to be extremely cautious of callers claiming to provide services to prevent unwanted calls. Claiming to be aware of the fact that you have been bothered by numerous unsolicited calls recently, the caller attempts to offer information and appliances in order to stop the calls. Unknown number sent numerous messages, knew details about myself which unnerved me. Generally, the purpose of the call is to obtain further information regarding your credit/debit card such as the issue or expiry date, account number, security code, to access your credit card account or use for identity theft. The caller said they were calling from British Telecom. As a former worker for BT they stopped calling themselves British Telecom back in the early 90s. To avoid falling a victim to these types of scams, you should never give bank or personal details on the telephone, especially if you have doubts about the legitimacy of the call. If the caller claims to be from your bank, phone them on the number that you normally use or know to be legitimate to confirm that the call you receive was genuine. The person who called, spoke English with an accent, said she was not trying to sell anything but merely conducting a survey. She seemed to know both my name and when I asked her how they have these information, since I’m registered with TPS, she got evasive and asked if I could just answer her some questions. In case you have provided personal and financial information to what you suspect to be scammers, you may contact your bank and, if necessary, ask them to issue a new credit/debit card. Moreover, you can report the scammers to the police at Action Fraud as well as on tellows to warn others who may be contacted by the scammers. This entry was posted in General, Knowledge and tagged annoying, cold calls, debit card, fraud, methods of fraud, nuisance calls, personal information, scam, scam method, scam numbers, telephone, telephone numbers, tellows app on Friday September 13th, 2013 by Luise. The most wanted of the week, number 01234567890 from Bedford, has made monthly appearances on the list since August and always ranked on first place. According to the overall consensus of our users, this number is used for a scam to gain access to the recipient’s computer by claiming it has been infected by a virus. This number called 5 times but leave any message; surely it is up to something bad. I dont how it had number but I have two theories. Either from ITV after submitting an answer to a competition or moneysupermarket.com after buying insurance, the only two companies I have recently given my number. This is the o2 collections department for overdue accounts. It’s an automated service, though, and will harass you for up to 24 hours AFTER you pay the bill. Trustworthy, but a nuisance, too. Ranking on our fifth and final place this week, the telephone number 01592642600 is another newcomer to the list even though it has been active for quite a while and with a tellows score of 8, is not exactly deemed trustworthy. While some have marked the calls originating from Kirkcaldy as aggressive advertising, other users suggested that the number was used for investigations regarding tax fraud. 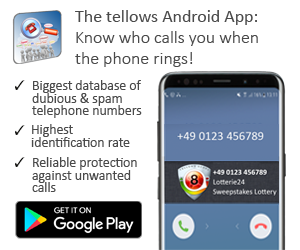 If you have further information on this or any other number that appears to be making dubious phone calls, you are more than welcome to contribute to our tellows community and exchange details about telephone numbers and callers with other users. Other than that, have a nice and hopefully peaceful weekend. This entry was posted in Weekly Top 3 Nuisance Callers and tagged annoying, nuisance calls, scam, scam numbers, spam, spam numbers, statistics, telephone numbers, tellows score, tellows.co.uk, Top 3, weekly on Friday September 6th, 2013 by Luise. According to a new survey conducted by Citizens Advice, two thirds of British adults have received messages related to claims for mis-sold payment protection insurance (PPI) – 98% of which were unsolicited and without permission. More than half also said they were contacted more than 10 times within the past year often considered a disturbance of everyday life for the recipients: whereas nearly a quarter received calls during dinner with family, 14% were interrupted at work. Furthermore, Guy stressed that nuisance calls “are often a sign that the service on offer is not very good or is actually a scam” and demands a ban for financial services firms from cold-calling to help consumers detect untrustworthy companies and scams. More than 90% of the participants of the latest Citizen Advice survey stated that they were contacted by telphone regarding PPI claims with 40% receiving automated messages on their landline whereas 35% were contacted via text message on their mobile phone. According to previous research of the organisation, nuisance calls were not restricted to claims management companies alone: cold calls accounted for 35% of complaints concerning financial services. To stay on the safe side, don’t provide any personal or financial information about yourself (and especially your bank account) on the telephone. Also don’t forget that you have the right to end the conversation by simply putting down the phone – especially if the person on the other end of the line seems to have a dubious agenda. If you have any information on a phone number that might be untrustworthy – PPI related or not – don’t hesistate to report it on tellows. This entry was posted in General and tagged claims company, cold calls, insurance scam, lo, nuisance calls, personal information, PPI, PPI claims, scam, scam method, scam numbers, statistics, telephone numbers on Thursday September 5th, 2013 by Luise. with another busy week of nuisance calls behind us, we have a new list of the most wanted numbers to share with you. This number called at 09.19 this morning. When I answered I could hear a ringing tone. A man answered and said that he was looking for Mr and Mrs Smith and apologised for ringing wrong number!? In light of ringing tone, wondering if I’ll be charged for the phone call! Another unknown caller is phoning from our second number, 08000641087. Keeping people’s phone line’s busy with frequent calls at all hours, the number is rated untrustworthy by most of our users, especially since the caller leaves no messages. Action Assistance work in conjunction with numerous key household named Insurers and Insurance brokers and we provide a variety of services including niche insurance and motor management services. We are independent advisors and we are normally prompted to call when the Insurers believe that their clients may not have received all that they are entitled to following an accident. Based on the experiences of previous posters, this is a pest call. I have had several calls from this number every day since I arrived in the USA. I never answer unknown numbers, I google them instead. How do they know I am in the USA? Orange must have told them. Or maybe one of the USA carriers I’ve connected to? Not pleased. One way to take on nuisance callers and dubious numbers is to report them on tellows and share your expierences with them. That way, other people can be warned against possible spam and scam calls and the various methods and strategies of scammers can be documented and exposed. So don’t hesitate to our tellows community and have a nice weekend. This entry was posted in Weekly Top 3 Nuisance Callers and tagged annoying, nuisance calls, scam, scam numbers, spam, spam numbers, statistics, telephone numbers, tellows score, tellows.co.uk, Top 3, weekly on Friday August 30th, 2013 by Luise. In the day of vast advancing technology, it is nearly impossible to keep track of all of the latest developments and the new possibilities subsequently emerging. Unfortunately, that also holds true for the various strategies and tactics of con artists who try to exploit the latest innovations for personal gain. One of these ever growing scam methods that has become rather popular among scammers is called “vishing” and, according to Financial Fraud Action (FFA UK), could affect nearly a quarter of adults in the UK. The equivalent to the e-mail scam phishing, the telephone ‘vishing’ scam is not fundamentally different from others: the caller tries to gain access to sensible personal information under false pretences. Posing as employee of a legitimate body such as the bank, police, telephone or internet provider, the scammer attempts to obtain personal details and financial information regarding credit card and bank accounts (e.g. the pin number) as well as personal information including the full name, date of birth or address. Once received, the information can be used to access and empty the account or to commit identity fraud. Some scammers may also try to persuade the victim to transfer money to another bank account or withdraw cash to pay them. This number called repeatedly over a period of a week. I finally answered and everything seemed legit. They asked for my card details to ‘verify’ my details with the bank. DO NOT GIVE THEM YOUR DETAILS. Be WARNED! !They phone me talking about Bank refunds too! They mentioned UKask, I looked this up found THIS “UKash Common Scams” saying…..Reclaim bank charges scam. Ignore mails or calls claiming that you’re entitled to a refund on overpaid bank charges. These will typically come from a scammer claiming to represent a bank, official agency or law firm and will require all your personal details, and may claim a charge for their services. Out of all the crimes in the past year related to online and phone banking, shopping and identity fraud, at least £7m of a total increase of £36m have been attributed to ‘vishing’ scams. Nearly a quarter of people in the UK have been on risk to become potential victims of the scam, receiving cold calls during which they were asked to offer personal or financial information. The FFA UK also reported that 4 in 10 people had difficulties distinguishing a trustworthy from a deceptive call. Furthermore, 30% of consumers stated that they had received at least 10 cold calls a month – 41% of which suspected the call to be dubious. This is a scam. If your card is stolen and HSBC calls you, they wouldn’t ask you to call back. I received a call from this number AFTER I cancelled my card. I terminated the call when I realised it was a scan. I didn’t call back and didn’t receive another call. A genuine fraud department would call again. In case you suspect to have been the victim of such a scam, contact your bank or card company immediately. If you know any details or numbers that seem suspicious or even dubious, don’t hesitate to share your information with us on tellows. Especially with scams like this one where the scammers are likely to use one number for several scams, it could help warning other people and possibly even prevent further scams. This entry was posted in General and tagged cold calls, fraud, methods of fraud, scam, scam method, scam numbers on Thursday August 29th, 2013 by Luise. […] I already knew it was a scam so i had a little fun asking them questions. Then i asked her if she even knew the name of my computer and she said “yes” so i asked, “what is the name then?” and she just hang up. Then when i tried calling the number, it apparently did not exist. I message for these silly fraudsters please learn the fact that the people of England are not stupid. We do realise that the World Wide Web would defnitely not have its company in City Airport and will not give someone as stupid as yourself its vacancies. Calling from a freephone number, 08000641087 is our second number of this week’s entry and remains somewhat of a mystery in spite of the frequent search requests of our users. All that our users do know for certain is that the number appears to be rather suspicious, calling frequently but never leaving a message. they call on behalf of other companies, to get removed from their calling list email your name and phone number along with a compalint to, [email protected] also ask to be added to their do not call list. had over the last days many calls from them, they just don’t give up, they say they are calling on behalf of a consumer customer service, when I asked which one, they did not want to say and said that I would have to identify myself first. I told them if you don’t tell me for which service this allegedly is, I don’t tell you who I am. I was called at an unsociable hour (8pm), they wanted to know if I was happy with my bank. I said I wasn’t interested and hung up. I don’t know how they got my number as I am ex-directory. I was very annoyed at the time they chose to call. Have a nice and nuisance call-free week (but if you don’t, please don’t hesitate to share any information on nuisance callers with our tellows community)! This entry was posted in Weekly Top 3 Nuisance Callers and tagged annoying, nuisance calls, scam, scam numbers, spam, spam numbers, statistics, telephone numbers, tellows score, tellows.co.uk, Top 3, weekly on Wednesday August 21st, 2013 by Luise. Sophie rang said they had been INFORMED I had been refused a loan! This is completely UNTRUE but I am concerned – where did they get this information from? Immediately I questioned the source of the information she hung up. Despite having complained to C R Smith – Gerard Eadie – these silent nuisance calls continue. A second report has been sent to OFCOM. Perhaps C R Smith should be handed a £90000 fine as was given to D M Designs recently. As always we like to remind you that if you have any information about dubious numbers please don’t hesitate to share them with our tellows community! Thanks to the knowledge our users have volunteered a lot of people were able to avoid scam and spam callers, so keep up the good work and have a nice, spam-free weekend! This entry was posted in Weekly Top 3 Nuisance Callers and tagged annoying, nuisance calls, scam, scam numbers, spam, spam numbers, statistics, telephone numbers, tellows score, tellows.co.uk, Top 3, top 5, weekly on Friday August 16th, 2013 by Luise.